Wireless controls remain mostly unchanged from the DIR-880L's. You get transmit power adjustment of High (default), Medium and Low, scheduled wireless on/off, radio disables and one guest network for both radios. WPA Enterprise / RADIUS mode is still not supported and more importantly, there are still no WPS controls. One thing the 879 has over the 880L is "Smart Connect". This term was originally coined by Broadcom for its tri-radio routers to describe a band-steering feature that is supposed to intelligently distribute devices between radios to optimize total throughput. Since then, I've seen the feature creep into some two-radio NETGEAR routers and now into the Realtek-based DIR-879. What this means on a practical basis is the router defaults to one SSID for both radios as shown below. Note in Smart Connect mode you have no control over channels. Disabling Smart Connect creates unique 2.4 and 5 GHz SSIDs. I placed the two band controls side by side in the screenshot; in real life they are in a single vertical column. There are no Smart Connect controls other than the enable / disable and the User Manual contains nothing about settings or function. We'll look at how the feature performs later. The DIR-879 has the distinction of being the first product tested with our new V4 router test process. The new process changes the way we measure routing performance and adds UDP performance testing as well. Routing throughput was measured with the router loaded with 1.01 firmware. You can download an Excel test summary that contains all functional and performance test results. You'll note the performance tests include data we aren't including in the Router Charts at this time, such as retries for TCP/IP tests, % packet loss for UDP and latency. Table 2 summarizes the performance test results. 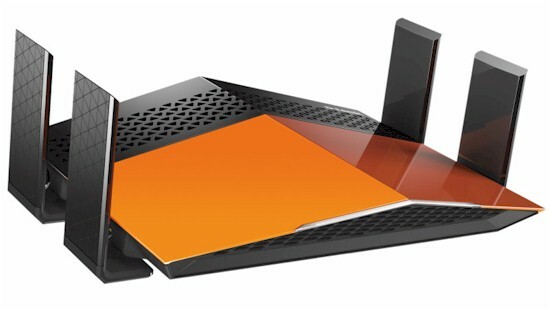 So we have something to compare, I retested two top AC1900 class routers, NETGEAR's R7000 Nighthawk and ASUS' RT-AC68U. Both TCP/IP and UDP unidirectional performance for all products are near the limit of the CDRouter testbed. This QA Cafe article further explains CDRouter's theoretical maximum application level throughput. The values include protocol overhead, which is why they're lower than 1000 Mbps. The surprising result is the ASUS' bidirectional throughput performance; it's the only one of the three to significantly drop throughput when loaded in both directions. I ran the test twice to ensure that the result wasn't a fluke. The V4 router test process does away with the Maximum Simultaneous connection test. Instead, we test whether the router can open 3,000 TCP/IP connections and then 3,000 UDP connections. Each connection is verified as it is established and verified again after all 3,000 connections have been opened. This test is tougher to pass than the Maximum Simultaneous connection, because connections must remain open longer. The DIR-879 passed the TCP connection test, but failed the UDP test. All 3,000 UDP ports were opened, but failed the second "still open" check at the end of the 2.5 minute long test. The NETGEAR was the only router in the group to pass both connection tests. The DIR-879 also is lucky to be the first to undergo our new Revision 9 wireless test process. 1.0.1 version firmware was loaded and the router reset to factory defaults. Channel 6 and 20 MHz B/W mode was set for 2.4 GHz and Channel 40 and 80 MHz B/W mode was set for 5 GHz. The router was positioned in the test chamber with the antenna group centered on the turntable as shown in the photo below. The 0° position had the front side of the router facing the chamber antennas. The V9 process uses an AC1200 class AC Intel Dual Band Wireless-AC 8260 card instead of the AC1900 class NETGEAR R7000 configured in bridge mode. So you really can't compare products tested with the previous Version 8 process with anything tested going forward. To reinforce this point, the Router Charts now display products for only one Version test process at a time, just as the Router Ranker has always done. The 2.4 GHz downlink throughput vs. attenuation comparison plot shows the D-Link with the lowest overall throughput of the three routers and also disconnecting the earliest, indicating inferior range. The DIR-879 fares a bit better in the 2.4 GHz uplink plot, with the highest starting throughput of the bunch. Unfortunately, throughput falls off much more quickly than for the other two products and again disconnects the earliest. The 5 GHz downlink profile places the 879 about midway between the ASUS and NETGEAR for strong signals (low attenuation). But the rapid decline between 12 and 18 dB attenuation drops it below the other two until it crosses back over at 30 dB and completes its run with higher throughput all the way out to the maximum test point of 45 dB. The 879 doesn't do as well for 5 GHz uplink, staying below the other two routers for most of the test run. Since throughput vs. attenuation plots are now done with a 2x2 STA, we have to use another method to measure maximum wireless throughput. The Ixia Veriwave emulates up to 4x4 ac devices, so that's what we now use. The results show the DIR-879 lower, but within striking distance of the ASUS and NETGEAR for the 2.4 GHz tests. The gap between best and worst is wider for 5 GHz, with the largest difference being 5 GHz uplink. In a second surprise for the ASUS RT-AC68U, both it and the D-Link run almost half as fast as the NETGEAR R7000 Nighthawk. In all, the DIR-879 won't win any SNB prizes for best wireless performance. But it's not horrible, either. With the major changes to our router test methodology, the ranking criteria also must change. Unfortunately, the current version of the Ranker supports only one set of ranking criteria per product class. We're hard at work on a completely revamped Charts system that will support multiple sets of ranking criteria and test data that will make everything right again. Please bear with us in the meantime. As noted earlier, D-Link doesn't say much about how Smart Connect works, so I didn't spend a lot of time testing it. I ran a quick check to see how it band-steered an assortment of dual-band devices. I gathered the devices, associated each one to the DIR-879 and started the IxChariot endpoint on each to ensure the devices wouldn't sleep. After confirming all were connected, the devices were moved to the hallway stairs outside my office, to knock signal levels down a bit. I then power cycled the router, waited for everything to associate and noted the band assignments. Fortunately, D-Link made this chore easy, with all the information needed shown simply by clicking the Connected Clients icon on the Home page network map. I repeated the process four times and entered the results into Table 3. Since all devices were getting strong signals, link rates were at or near their maximums. So the Smart Connect algorithm should not have had much problem determining fast and slow devices. With the assignment above, it's unlikely the router would achieve best total bandwidth utilization, with low link rate 1x1 N devices assigned to 5 GHz and the only 2x2 AC device assigned to 2.4. AC1900 class routers have definitely matured as a class and prices have come down enough that the DIR-879 isn't the bargain it was intended to be when it was introduced only five short months ago. For about the same or less, you can buy a Linksys EA6900, TP-LINK Archer C9 or even a D-Link DIR-880L, all of which support USB storage and printer sharing. Even USB support doesn't float your boat, there is no reason to recommend the DIR-879 over these or the top-rated (but more expensive) NETGEAR R7000 or ASUS RT-AC68U.